I am a sucker for a rare or unusual plant. Give me a packed table at a plant fair and I will spot the rare treasure from a mile off. The plant may not be pretty, cheap, or suitable for my garden, but I shall probably buy it; not simply because I can, but because it interests me. I am fascinated by plants, how they grow and how they look. I want to broaden my knowledge and learn by doing rather than from reading text books. A new plant may flourish or it may die, and though I don’t enjoy killing plants, I’d rather have a go than not try at all. Even if death is the result of my careful ministrations, I will have learned something; usually sufficient to know whether I should try again. Plants are like friends – some will come and go, making space in your life for new ones. The ones that really like you will stick around for the long haul. And so we come to today’s subject, Buddleja speciosissima, a shrub that hails from the mountains of southern Brazil. I am sure we can all agree that these conditions are probably quite different from those in east Kent. However Nicholas Lock, specialist grower of rare and hard-to-find trees and shrubs, assures me that it has been cultivated succcessfully in gardens in northern France, so I decide to give it a go. I picked up my plant, perhaps 14″ tall, at the Cornwall Spring Flower Show (see above, the plant second in from the left). It was one of only two on a stand spilling over with seriously choice plants. My buddleja has already been repotted twice and now stands 4′ tall and counting. At the base of the main stem there are lots of healthy side-shoots forming. My plant is rudely healthy and I’m excited to see if I will enjoy flowers this year. So far, so good. The foliage of Buddleja speciosissima is unmistakably that of a Buddleja – elongated, slightly floppy and a mid-green shade. The big difference with this species is that both the underside of the leaves and the subquadrangular stems are covered in a thick white coating (correctly described as indumentum), as if someone has taken a can of spray snow to the plant. I believe this attractive woolliness diminishes as the plant matures. In summer the main event is the appearance of flower spikes – also woolly – which grow up to 20cm in length. 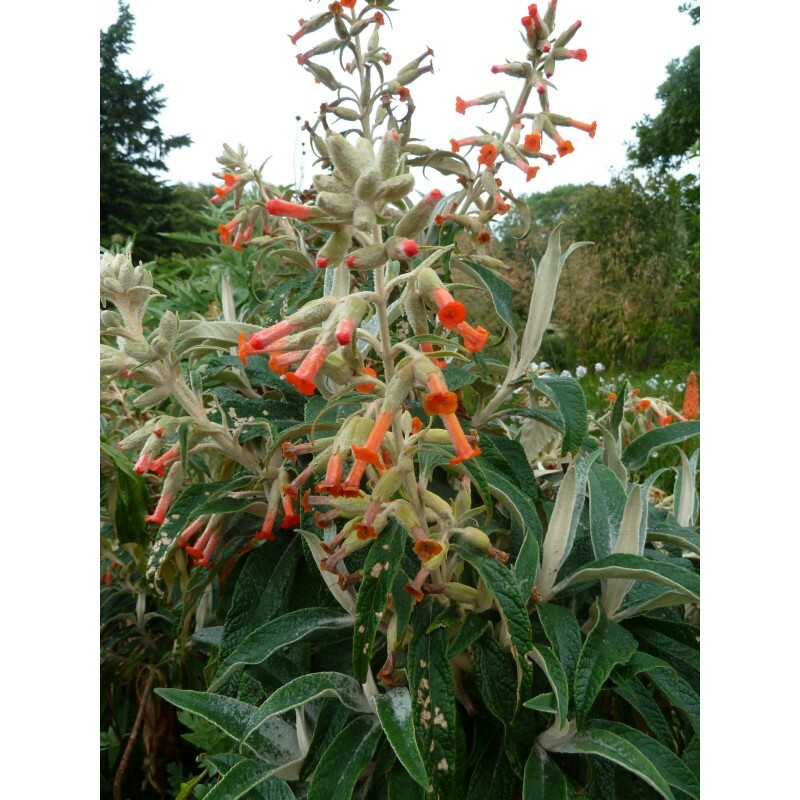 They carry tubular, orangey-red flowers, each 2-3cm long. In their natural habitat they are pollinated by hummingbirds. Not so many of those in Broadstairs so we shall see if they attract butterflies instead. At home in Brazil, Buddleja speciosissima colonises dry, rocky grassland at high altitudes, suggesting it will grow well here in poor soils with good drainage. 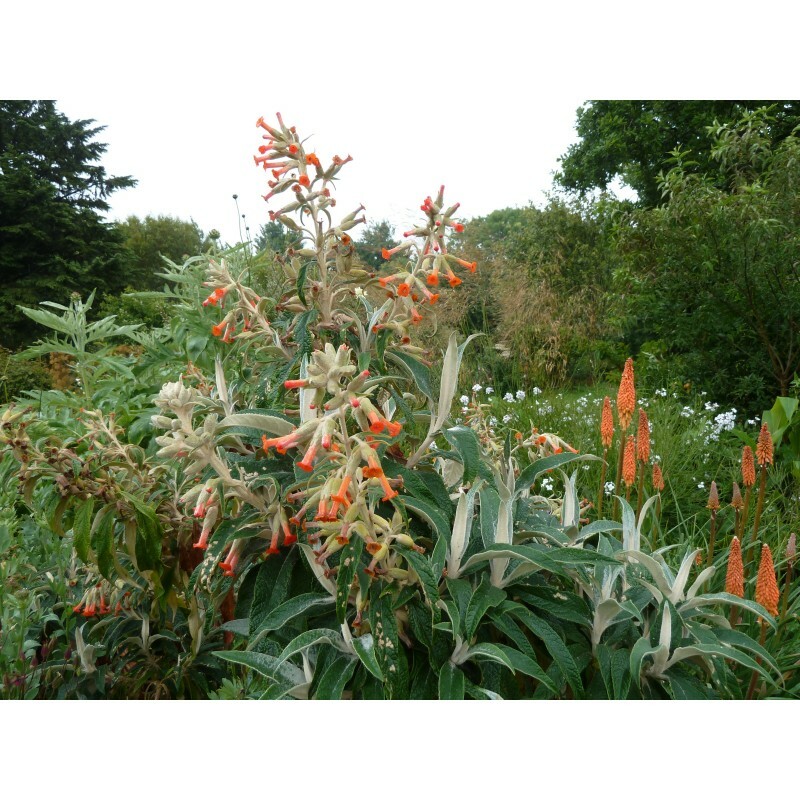 Being new to the UK, the plant’s hardiness has yet to be established, although Arven Nurseries in France suggest it will cope with short spells as cold as -8ºC. I intend to protect mine over winter to be on the safe side. As for its place in the garden, Buddleja speciosissima would obviously look terrific in any exotic planting scheme, or in a dry, sunny situation such as a gravel garden. Eventually reaching 3m in height, Buddleja speciosissima is possibly a little too large for a conservatory or greenhouse and I’m not yet sure if it will take the kind of coppicing that keeps other buddleja in check. I can find only two sources of Buddleja speciosissima in the UK. The first is Nicholas Lock, from whom you can buy at a number of specialist plant fairs throughout the year. Call in advance to check there are plants ready for sale. The second is Pan Global Plants, who offer mail order, subject to availability. Visit the website for details. In France, Arven Nurseries also offer Buddleja specisiossima, although they are out of stock at the time of writing. I hope the nurseries mentioned will forgive my use of their images until such a time that my own plant flowers. Early results would suggest this a shrub well worth seeking out, especially if you garden in the warmer south or drier east. TFG.